David Davila is eager to share the thrills of Thoroughbred ownership with about 90 new friends on Saturday at Tampa Bay Downs. The Ocala-based attorney, who owns 75-acre Backstretch Farms in the heart of central Florida's horse country, will be here to watch his 3-year-old gelding War Bridle compete in the $125,000, 7-furlong Pasco Stakes. War Bridle is trained by Joan Scott and will be ridden by Pablo Morales. Although War Bridle is 30-1 on the morning line, hope springs eternal for his connections. War Bridle won a 6-furlong starter/optional claiming race here on Dec. 8 by seven-and-a-quarter lengths, and his workouts leading to the Pasco have been fast and spirited. The Pasco, which has drawn a field of seven, including Inaugural Stakes winner Gladiator King and fellow stakes winners Jackson and Zenden, is one of three stakes on Saturday's 11-race Skyway Festival Day card. The Pasco will be contested as the seventh race. Also on tap are the $125,000, 7-furlong Gasparilla for 3-year-old fillies, which is the ninth race, and the $50,000, mile-and-a-sixteenth Wayward Lass Stakes for older fillies and mares, which is the third race. The Gasparilla attracted 11 horses, including the well-regarded Bella Ciao, stakes winner Into Trouble and Into the South. Post time for the first race is 12:09 p.m. Meanwhile, on today's program, the late Pick-5 was hit, returning $15,257.60 for $1 and $7,628.80 for the minimum 50-cent wager. There were 31 winning 50-cent tickets sold on the winning 11-8-1-10-8 combination. Six weeks ago, War Bridle was the surprise winner of the aforementioned starter/optional claimer, which served as the first-ever “Tampa Bay Owners Club” race. The 90 fans who correctly selected War Bridle as the winner became part of the club, with perks including an attractive pin identifying them as club members, free admission, a program, a mutuel voucher and concession-stand discounts each time War Bridle competes at Tampa Bay Downs. Club members also will be allowed inside the paddock before the Pasco and in the winner's circle, should he spring another upset. War Bridle checked a lot of boxes for Davila during his trip to Lexington, Ky., last summer for the July Selected Horses of Racing Age Sale. His pedigree and conformation were appealing, and the (then)-2-year-old had set a track record at Belterra Park for four-and-a-half furlongs in his maiden victory on June 29. He and his family – his wife, Kimberly, and their 12-year-old son, David – are up to 21 horses, comprised of horses of racing age, just-turned 2-year-olds and yearlings. For all, it is the thrill of a lifetime, no questions asked. “It was a childhood dream of mine to own a farm and race horses, since my father Julio took me to the track in Puerto Rico as a child,” said Davila, who turns 42 Tuesday. “War Bridle's success is exhilarating for all of us. Our expectations for him were not overly high, but we thought if we gave him a rest and sent him to (bloodstock agent) Nick (de Meric), he could develop to a higher level. He's also benefited from the individual attention and care Joan is able to give him. “My dad is on Cloud Nine over this horse. To be able to give him an experience like this is amazing; words don't explain it. He was a truck driver and worked three jobs to send me through school,” Davila said. Davila encourages members of the “Tampa Bay Owners Club,” and others, to consider participating as actual owners, but to be realistic and prudent in their approach. “If you really have a passion for horses and have the disposable income, by all means I think it is worth it,” he said. “But it's an expensive sport and you can't go into it expecting to make a profit. Davila and Scott will be special guests of track announcer Richard Grunder at 10 a.m. on Saturday at his “Morning Glory Club” Show on the first floor of the Grandstand. Admission is free and attendees receive donuts, coffee and Grandstand passes. 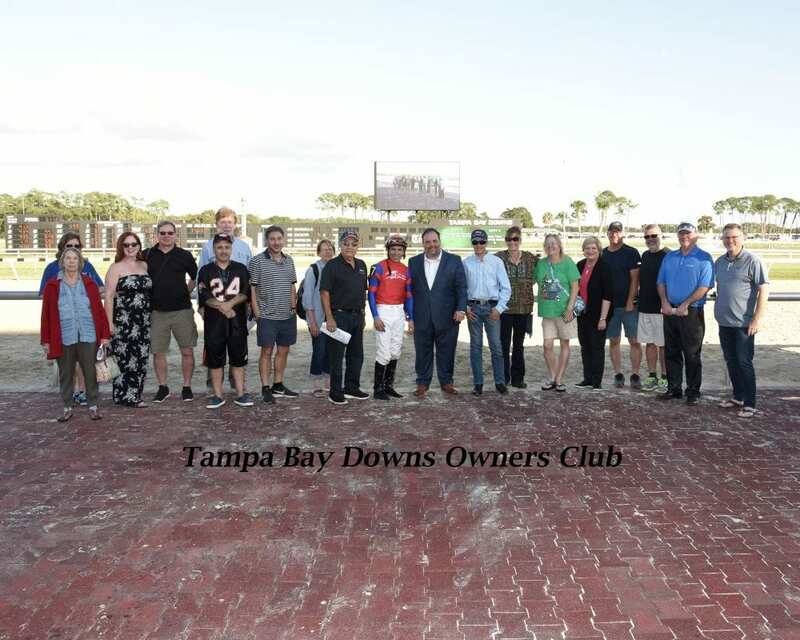 This entry was posted in Racing and tagged david davila, Joan Scott, pablo morales, pasco stakes, tampa, tampa bay downs, tampa bay owners club, war bridle by Press Release. Bookmark the permalink.